Hacking / Modding Kanban Boards Makes Them Better! Weavers love to tailor frameworks to better meet their needs. A great way to do this is to start with a core framework and then extend it with additional frameworks or replicate it to enable collaboration at scale. This design tip will present several different Kanban boards... with the warning that you may find yourself inspired to start using Kanban in a whole new way! Oh - this is not a post on WIP, Lead Time, Cycle Time or any of a host of other ways to use Kanban boards. You can find plenty of information on these topics. This is a post on designing your Kanban board - which means - if you can draw it, you can bring it to life in Weave! Arguably the most common customization is to simply add columns that match the flow of your work. This example is from Kantree. In Weave you can capture columns as regions to help you understand the placement of items. Note that a Kanban board that represents flow doesn't have to be limited to putting things into production. We have clients who have tailored Kanban boards to capture the removal of production systems. It is no secret that we love the Impact-Effort Matrix as a means to help promote collaboration between business leaders and technical teams. Accordingly, one of our favorite improvements is to replace the ToDo column with an Impact-Effort Matrix. This enables teams to make even more informed choices about their work. In this post Tomas Rybing presents an extended Kanban that includes priorities flowing into the board via a triangular shape along with a provision for expedited work (the "fast lane"). Personally, I prefer the Impact-Effort matrix for establishing priorities as I think it creates a more collaborative exchange. One of the problems of rigid swimlanes is that it can be hard to adjust your Kanban board if you need more or fewer swimlanes. You can just use Weave's powerful regions to just create the swimlanes you need, dynamically adjusting your board as needed, whenever needed. And of course regions can be used to capture WIP limits. A client recently asked me to create a single Weave canvas that could allow them to track process improvements for 10 Scrum teams in 2 locations. I started with a simple Kanban board with an Impact-Effort matrix and then split the Done column to capture improvements that should be shared with other teams vs. improvements that should be celebrated within the team. I completed the design by replicating the base Kanban for each team. Note that I also snuck in a Prune the Future framework into the lower left so that the growth of all the teams could be captured. This is managed "Scrum Master Tribe", a semi-formal group of all Scrum Masters. Now my client has a single Weave board that every developer in the company can review. It is important to know the status of every project or task in your Kanban board (such as tasks that need more content or tasks that are blocked). Weave's customizable icons makes this really easy. 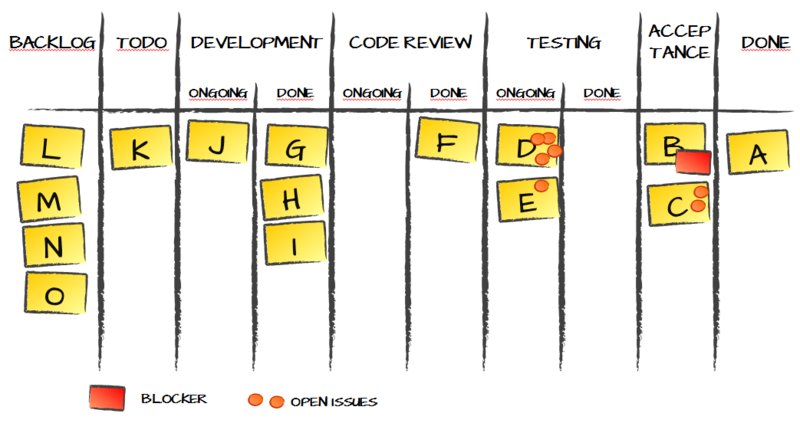 A Kanban board is a powerful framework. Weave gives you extra power to make Kanban boards that can be tailored to meet your exact needs. I hope this newsletter has given you some ideas - because if you can draw it, you can make it a framework in Weave!